Whether you are designing a completely new dining room from scratch, or you are looking to add some flair to your existing dining room, the trends can change so fast that you don’t know where to begin. Decisions about dining room interior design and renovations are some of the most important remodelling decisions you can make. If you are going to be entertaining and hosting parties, or are considering selling your home in the foreseeable future, your dining room needs to look just right. Below are four design ideas to inject some life back into your dining room. If you feel like your windows aren’t adding enough style to your dining room, a simple touch of pattern to your window treatments (blinds, draperies, curtains) can really add some elegance and depth to a dining room. Roman shades inside a modern floral pattern can take years off your furniture if it is a bit outdated. Your dining room should radiate warmth and openness. This isn’t possible if the room is poorly lit. Make sure your dining room is getting plenty of natural light, and if natural light is unavailable, augment it with attractive light fixtures and a bright colour scheme. Modern lines on the windows, floors and walls can really make your dining room colours pop. One of the main points of C+dining room design is adding character. You don’t want to be all over the place thematically, but one of the major ways that you can add some charm and character is by mixing and matching. If you have a more traditional dark hardwood table, you can mix and match chairs. If you want to inject some life into a monotone design, try some floral wall paper. Kitchen and dining room renovations don’t need to be complete, expensive overhauls. You can easily add elegance to your dining room by going with french accents. Traditional looking and antique pieces that employ simple colours and classic designs can turn a boring dining room into your home’s crowning jewel, and you don’t have to break the bank to achieve the look. Creating the perfect dining room requires some work. You want your dining room to look elegant, but not sterile, creative, but not thematically distracting. 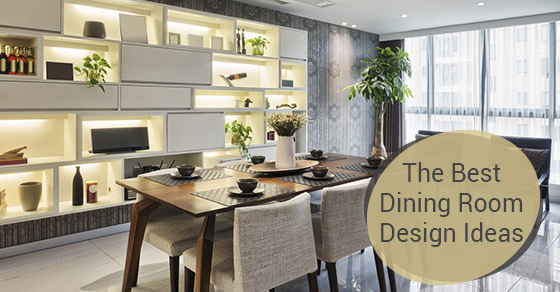 If you are in the process of renovating or redesigning your dining room, but don’t know where to begin, keep the above dining room design tips in mind.